ON the second-to-last day of the University of Hawaii baseball regular season, Derek Tatsuno threw the first pitch. Looked like he could do it a hundred more times if he wanted. He came up to the press box later. Sitting in the second row, waiting to do some radio and TV. Quiet as usual, but with that wry grin of his, taking everything in. "Nice pitch, but I think you missed," I ragged. "A little too much in off the black. A good righty might have tagged it." Derek smiled some more, but shook his head. "No, it was there. Unhittable." With most ceremonial first-pitch dudes, you laugh because it takes six bounces for the "throw" to get to the plate, or the catcher has to run to the backstop to retrieve what looks like a pop fly. With Derek Tatsuno, you good-naturedly debate inches with him, if he hit the corner or not. And you try to figure out if there's a way the Rainbows can take him to the WAC tournament, using that senior year he passed up in 1980. Today, Tatsuno enters the College Baseball Hall of Fame in Lubbock, Texas. He's just a couple of years older than Roger Clemens and Randy Johnson. If things had gone a little differently, who knows? He might be on the verge of going into that other Hall of Fame, the one in Cooperstown. But "Tats" never threw a pitch in the major leagues. Sadly, the most dominant college pitcher of his era -- maybe all-time -- didn't even come close to making a big league roster. When Tats decided to move on after winning 20 games (still an NCAA record) as a junior in 1979, it was to Japan, not the mainland. In a move akin to changing Michelle Wie's beautiful golf swing, coaches there insisted he alter his three-quarters delivery to over-the-top. This took much of the life out of his fastball, the break near the plate that helped him strike out 234 college batters in one season -- another record that still stands. Tatsuno was never the same. After 2 1/2 seasons in Japan, he kicked around in the American minors for a few years but couldn't regain his dominating stuff. He finished in 1987, with the Hawaii Islanders. In 1998, legendary UH coach Les Murakami told me too much work in college and summer leagues might have led to Tatsuno's demise. Derek agreed to some extent, but believed that the coaching in Japan was the main reason. For three years, though, the Aiea High School graduate was nearly untouchable. "For one thing, he had charisma that very few people have," Murakami said in 1998, when Tatsuno was named one of three Players of the Century by Collegiate Baseball. "And he had supreme confidence that he was going to win. He was one of those kids that when he wasn't pitching he just fooled around, kind of a jokester. But when he was pitching he was all business. I've never seen anyone focus like him. Tremendous poise, great control and a great breaking pitch." So we're left with the inevitable "What ifs." What if Derek went to the American pros instead of Japan? What if he'd skipped summer ball between his sophomore and junior seasons? What if he'd stuck around for his senior year (would UH have won the College World Series instead of losing two championship games to Arizona)? Derek Tatsuno was the Colt Brennan of my generation, overflowing with talent and presence and affecting the team, school and community in positive ways beyond unprecedented on-field exploits. His left arm was as accurate as Colt's right. It built Rainbow Stadium, leaving something significant for future UH athletes the way Colt hopes to facility-wise. Right now, Tatsuno remains atop the pantheon of all-time UH athletes. That could change if Brennan leads the Warriors to an unbeaten season and is in attendance in New York when they hand out the stiff-arm statue. But for now, it's still Tats. 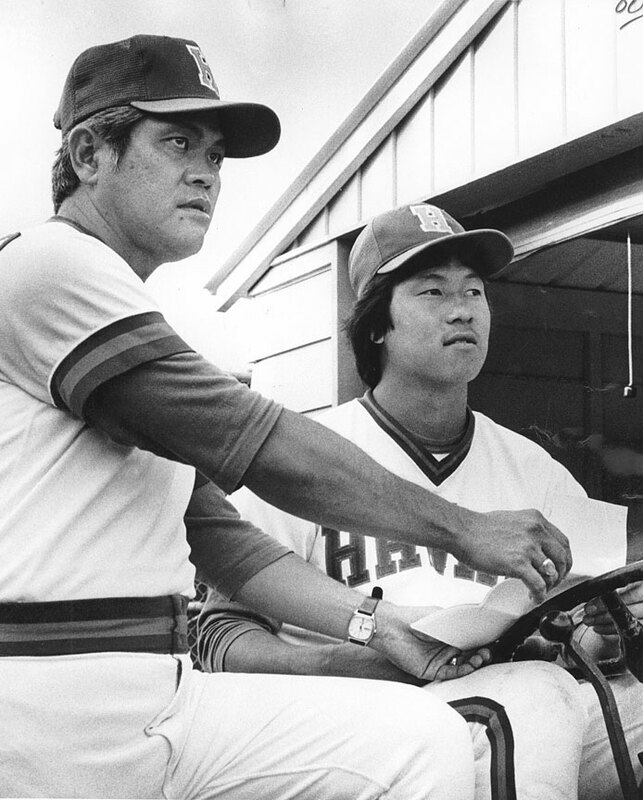 Tatsuno and Murakami laid the foundation that made Hawaii baseball one of the nation's elite programs. Tats didn't make it into the college hall with last year's inaugural class as he should have. The reason might be the same one that allowed him to build up the huge stats that can't be ignored. Too many innings in the college years helped lead to no innings in The Show, and a lack of name recognition among many of the voters, who should know better. A college Hall of Fame should be about what you do in college, not after. Today, Derek Tatsuno can shine in the light of those three seasons that were like none other, anywhere for anyone. Those who saw him pitch in his prime know he was the real thing. When we think of Derek Tatsuno, we can't help but do so in terms of "What if?" But I will always come back to "What stuff!"